Excited news as brand new dresses from our 2019 have arrived in store! Beautiful new styles and trends from leading bridal designers – especially Ronald Joyce. We love beautiful classic, simple lines and soft fabrics. impeccable attention to detail and an amazing structure to show most of feminine figure… One of our top favourites is Imola ( pictured) and Idony ( stunning and classic satin ball gown). We have received over 20 beautiful styles ready to be tried on in our Maidstone luxurious store. If you getting married this summer- we have a choice of over 100 gowns available to take home straight away at affordable prices. The Romance Collection is affordable, modern and comfortable range of bridesmaid dresses is a great addition to our Collections. These beautiful dresses that take you through the big day, the big party and forever after. Stunning lace details, sparkly embellishments and modern simple designs flattering for or shapes and sizes. Available in more than 100 colours with mix and match option for junior bridesmaids as well as little flower girls. Take advantage of our introductory offer! Buy 2 and get 3rd half price! Price range £190-£240. We also offer made to measure service if required ( small charge added to the price) as well as in house alteration service for your piece of mind. Book your appointment today to choose colours for your weeding- simply use our booking form in Book an appointment section! We love our job! 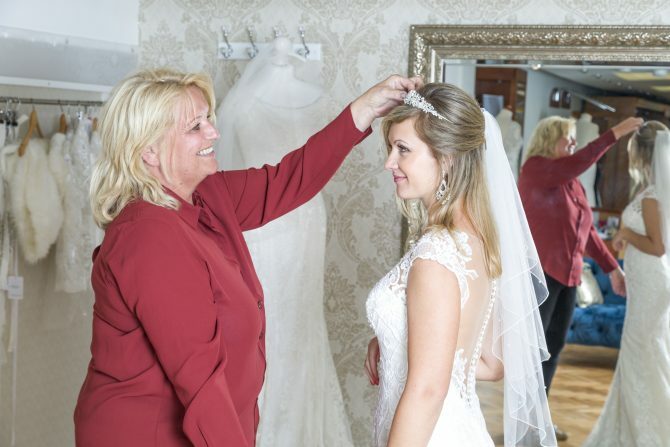 Visit us in our beautiful bridal store located in the centre of Maidstone. Two stores of stunning wedding gowns ready for you to try on! We have a wide range of designer wedding dresses from Ronald Joyce, Victoria Jane, stunning and elegant White One range from Pronovias as well as well known Rebecca Ingram by Maggie Sottero. From bling and glamour to simplicity and sophistication… With personal approach during our one to one appointments you can begin your exciting journey of finding your perfect wedding gown….Book your appointment today using our contact form or simply give us a call.